Spotify lets you copy web links and URIs that you can paste anywhere you like: in blogs, e-mails, social networks, even word-processing documents. Right-clicking what you want to share and choosing a copy option from the pop-up menu that appears usually does the trick. In some cases, if you know how a link is constructed, it may even be quicker to type it in directly — for example, linking to a user always takes the form http://open.spotify.com/user/username. Want to share a track, artist, or album you’re listening to? 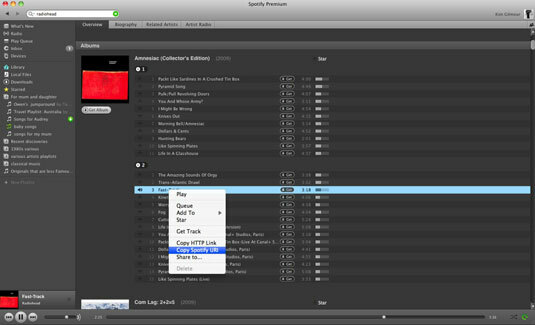 Just right-click the name and, from the pop-up menu that appears, choose either Copy HTTP Link or Copy Spotify URI. Choosing one of these options copies the address to your computer’s clipboard, which is like writing a message onto a virtual notepad. You can later transfer (or paste) the message to its rightful place. You press Ctrl+V (Command+V on a Mac) to paste it. For example, you could paste an HTTP address into your Facebook Status Update text box. Facebook automatically turns the address into a clickable link. Spotify can also make any search results into a link. In previous versions of Spotify, doing this was quite simple — after conducting a search, you’d right-click the keywords that appeared at the top-right of the Spotify window to open a pop-up menu that let you copy the search link. In the current version, you don’t seem to be able to right-click these results. For a URI-style link, type your search query after the parameter spotify: search:. For example, a search for only happy when it rains becomes the address spotify:search:only+happy+when+it+rains for the URI-style link. For the HTTP web link, this becomes http://open.spotify.com/search/only+happy+when+it+rains. You can also link to a specific track time. For example, you know the loud bit in Radiohead’s “Paranoid Android,” where you feel like jumping around like mad? That’s about 2 minutes 40 seconds in, and you can link right to that point in the song. When you right-click the track name and copy the Spotify URI, you get spotify:track:0LTZD4vTsp0EN1wXatc9IR. To link to the desired track time, add the hash symbol (#) to the web address, followed by the timestamp. So, the address now becomes spotify:track:0LTZD4vTsp0EN1wXatc9IR#2:40. You can also link to someone’s Profile page. The URI for your Profile page takes the form spotify:user:yourusername, where yourusername is the name you use to log into Spotify (for example, mine is jasminetea). The URL type is http://open.spotify.com/user/yourusername.